The U.S. Senate voted to confirm President Obama's appointments to chair the National Endowment for the Arts and the National Endowment for the Humanities. Rocco Landesman, a Broadway producer noted for award-winning productions like Angels in America, Big River and The Producers, was confirmed as the new chairman of the National Endowment for the Arts. For twenty years, Landesman has been the president of Jujamcyn Theaters, New York's third largest theater owner. Jim Leach was also confirmed as the next chairman of the National Endowment for the Humanities. Leach is a former Republican congressman from Iowa and is a professor at Princeton University's Woodrow Wilson School of Public and International Affairs. I've just discovered the work of Pennsylvania artist Jason John at the Andrea Pollan juried show at the Target Gallery in Alexandria, Virginia and I was very impressed by John's piece in that very strong show full of gems. And it is not only the amazing technical virtuosity of this hyper-realist artist, but also the intelligent composition and the way that the concept and idea is delivered by John's skilled brushwork. 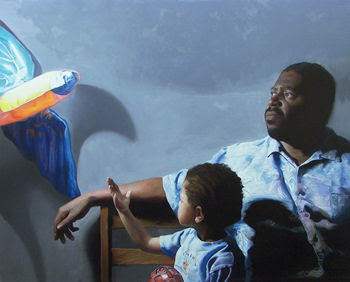 Look at the subtle way that the "paranormal" in the work (in this case the floating balloons) is introduced... we almost miss it as we're enchanted by the brilliant twist of the child's wrist and the terrestial look in the man's face. My recent post on the issues facing the Torpedo Factory has been getting a lot of attention. My good friend Margaret Huddy (and a superbly talented artist) pops in with some very enlightening stats and also lets us know that "Mr. Pope got Joan Aldrich's name wrong. I wondered why I had never heard of her. Her correct name is Joan Ulrich and she does have a studio on the first floor. She is a ceramic artist." Here are some statistics on lease-holding TF artists. There are currently 143 leaseholders. Of them only 18 are original artists. In the 20 years between 1974 and 1994, 600 artists have been leaseholders. From 1993 to 1003, 113 lease-holding artists left. From 2004 to 2009 33 leaseholding artists left and 41 new artists were added. From 2007 to 2008, nine more artists became leaseholders. Only 10 artists on the waiting list of juried artists are actually wanting to have studio in the art center. Many of the rest live as far away as Washington state and California. They keep their name on the list "just in case" they ever move back (one is 85, so I doubt she will, but you never know). We do the best we can to attract new artists for our annual jury but many people find the idea of working in the public eye very daunting. One artist who sublet from me left after three weeks. She said she felt like a monkey in a zoo.